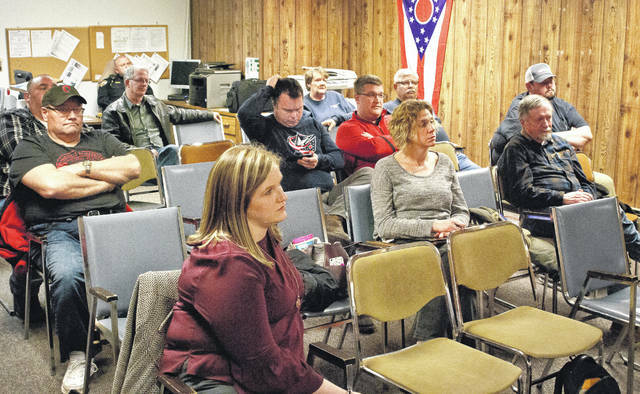 Ostrander residents listen to a presentation given by village council member Robert Taylor explaining the reason why council enacted a 1 percent income tax in the village. An ordinance was approved by council on July 11, 2016, for a 1 percent income tax that took effect in January 2017. Since that time, a group residents have circulated a petition asking for a referendum on the May ballot to overturn council’s decision. However, since the creation of the new ordinance, it has caused what Mayor Larry Crile calls a “stir.” There has been a group of residents circulating a petition to place a referendum on the May ballot that would ask voters to either repeal or keep the tax. An ordinance was approved by village council on July 11, 2016, for a 1 percent income tax that took effect in January 2017. For the record, Crile clarified a comment he had made in a March 2 article in The Delaware Gazette. Crile said he hoped to get some interaction from residents and council during the meeting. Part of that process was Taylor’s presentation on the village budget and why the income tax was needed. Taylor said the village receives a total amount of $167,957 from a combination of zoning fees, the local highway fund, property tax, lessor taxes and other income, local government, gasoline tax, license and registration fees, and the income tax. “These numbers do not include any of the sewer utilities,” he said. Taylor said the money that comes in from the sewer billing can only be spent on the sewers. “Legally, we’re not allowed to mix funds,” he said. Taylor said as of 2018, the income tax has become the village’s largest funding source. “That allows us to spend the money on things like the general fund and the street maintenance fund,” he said. Taylor explained that the village gives a 100 percent credit on the 1 percent income if a person pays income taxes in another municipality. “If you pay income tax somewhere else, Ostrander recognizes that and doesn’t collect the income tax from you,” he said. Taylor pointed out a few of the other surrounding municipalities that collect income taxes and don’t give a credit to their residents if paying income taxes to another municipality. “Plain City is 1.5 percent with a zero percent credit,” he said. Taylor said the only residents exempt from paying the income tax are retired individuals. Taylor said a person owning a $200,000 home in Ostrander pays a total of $3,078 in taxes annually. He said various institutions like Buckeye Valley Local Schools, Scioto Township Fire, Delaware County General Fund, Delaware County Career Center, Delaware County Library, Delaware Morrow Mental Health, Delaware County 911, Delaware County Health Department and Preservation Parks all require a percentage from property taxes. Taylor said the village receives $73 per home annually from property taxes to maintain the roads, to run the village, to pay legal fees, and pay engineering fees for future plans. Crile said one of the people pushing for the referendum to repeal the income tax left halfway through Taylor’s presentation. This entry was tagged Crile, D. Anthony Botkin, Ostrander, Taylor, Wilcox. Bookmark the permalink.